James Ker et Christoph Pieper (éd. 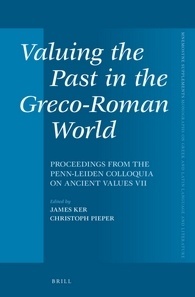 ), Valuing the Past in the Greco-Roman World. Proceedings from the Penn-Leiden Colloquia on Ancient Values VII, Leyde-Boston, 2014. The ‘classical tradition' is no invention of modernity. Already in ancient Greece and Rome, the privileging of the ancient played a role in social and cultural discourses of every period. A collaboration between scholars in diverse areas of classical studies, this volume addresses literary and material evidence for ancient notions of valuing (or disvaluing) the deep past from approximately the fifth century BCE until the second century CE. It examines how specific communities used notions of antiquity to define themselves or others, which models from the past proved most desirable, what literary or exegetic modes they employed, and how temporal systems for ascribing value intersected with the organization of space, the production of narrative, or the application of aesthetic criteria. Contributors are: Karen Bassi, Lisa Cordes, Joseph Farrell, Caitlin C. Gillespie, Jonas Grethlein, Joseph A. Howley, Casper C. de Jonge, James Ker, Lawrence Kim, Christina S. Kraus, Eleanor Winsor Leach, Maaike Leemreize, Jeremy McInerney, Margaret M. Miles, Sheila Murnaghan, Jason S. Nethercut, Christoph Pieper, Ilaria L.E. Ramelli, Amanda S. Reiterman, and Mieke de Vos.